Cape Town - Standard & Poor's downgrading of South Africa to junk status brings the country a step closer to a descent into a failed kleptocratic state, cautioned the South African Federation of Trade Unions (Saftu) on Tuesday. 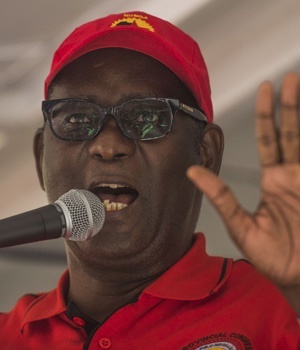 The newly-registered trade union federation headed by Zwelinzima Vavi said in a statement the downgrade has turned what was already a major national crisis into a potential catastrophe. The ratings cut follows the widely condemned Cabinet shakeup by President Jacob Zuma. Saftu made no bones about its condemnation of credit ratings agencies. It described them as acting like "policemen for international monopoly capitalism" and "blackmailing countries into adopting their preferred policies". However, it noted S&P's concerns about political instability in the country relating to the downgrade. "Their decision in this was ... facilitated by Jacob Zuma’s reckless sacking of ministers, which gave them a perfect excuse to act. We are another big step nearer to a descent into a failed kleptocratic state." In the light of this, Saftu said it is now more vital then ever to mobilise the biggest ever protest movement to rescue millions of South Africans from the increased unemployment and poverty which will inevitably follow this downgrade. The federation has therefore resolved to step up its campaign with a four-part strategy. Saftu intends to take action in the high court to argue that Zuma’s conduct is not in compliance with the Constitution, and has been irrational. "The main reason for filing a court challenge is that Zuma has once acted against the interests of the country in direct contradiction with his oath in which he swears to act in the best interest of the country." The federation said the evidence will include statements by ANC leaders. "This case will provide a platform for a thorough examination of Zuma’s role and provide even more justification for his removal. We are appealing for support from all those who agree with us to join this action." Saftu said it will continue to campaign alongside civil society, communities, religious groups and other workers’ organisations, which has already led to successful demonstrations outside the Ministry of Finance and elsewhere. "We shall however steadfastly stick to Saftu’s principle that it is independent, though not apolitical. This is not a sectarian campaign for or against any faction or individual. "We shall continue to highlight that the underlying reason for the crisis is the continuation of the monopoly capitalist system and the ANC government’s consistent policy of reinforcing it through neoliberal policies like GEAR [Growth, Employment and Redistribution] which have led to the high levels of unemployment, poverty and inequality." Saftu said the workers’ movement must not stop criticising all those responsible for the crisis in the ANC, successive cabinets, including finance ministers, big business, executives of state-owned enterprises as well as all those who have benefited from the burgeoning scourge of corruption and looting. "This is not confined just to Zuma and the Gupta family, but to all those politicians who have accepted bribes and the companies that have paid them. They must all be held to account." A proposal is on the table for the formation of a national crisis committee to coordinate the ongoing campaign more effectively, said the federation. "The working class must not be just an appendage to any such committee but a leading component of it. Workers and the poor are always the main victims of corruption and capitalism, and we will insist that the Crisis Committee must take up workers’ issues." Saftu pointed out that trade unions have always understood that one can never win at the negotiating table what one has not won on the streets. "The same applies to national campaigns like the present one. However successful civil society campaigns are, the decisive role has to be played by the workers because of their key position in the economy as the creators of wealth." The federation said it has therefore resolved to make a submission under Section 77 of the Labour Relations Act for a protected general strike on socio-economic issues. "It will be based on the devastating effect of the Cabinet reshuffle and the (effect the) downgrading to junk status will have on workers’ jobs and living standards."